The loss, or lack of appetitive, is medically referred to as Anorexia. The first sign of illness is often loss of appetite. It is important to get your hedgehog checked out right away by a veterinarian, if you cannot easily determine the reason for the change in eating pattern. 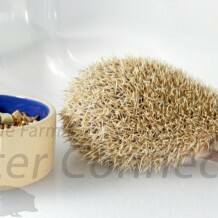 It is not uncommon for hedgies to skip their first meal or two, in their new home. Sometimes hedgehogs are just too busy sleeping, exploring, or running on the wheel, to take the time to eat. Waiting to introduce the wheel, after the hedgehog has acclimated to eating and drinking in its new home, will help prevent eating distractions. Make sure your hedgehog is warm and comfortable and that they have easy access to their water bottle or dish and that your hedgehog in fact is drinking. Our small bag of “baby” food is the “trick up our sleeve” to tempt babies into eating when they go to new homes. It tastes really good to them and they will typically eat it without a problem. It is very rich so even a little food will sustain them through their adjustment period. Refer to our Environmental Stress and Not Eating article for more information on this topic. It is a good idea to keep your hedgehog on the same diet for at least a month, to make sure it is well adjusted to it’s new home. Try new foods gradually instead of introducing a new food “cold turkey”. Slowly add the new food into the old food and gradually increase the new food to old food ratio. Hedgehogs that do not like a new food my simply refuse to eat. Many breeders suggest using bottled water or highly filtered water when transitioning hedgehogs from one home to another. Again, if your hedgehog doesn’t like the water it won’t drink. Not only does well water taste different than municipal water, but well water also tastes different from other well water and different municipal waters taste differently. One example that illustrates this animal habit is soda pop preferences. Some people LOVE Coca Cola. They could drink it all day long as their drink of choice. However, the same people are likely to hate any other cola and would rather get very thirsty, than drink any cola but Coke. On the other hand many Coke drinkers wouldn’t mind Dr. Pepper or another kind of soda, as long as it isn’t a cola. Some hedgehogs have difficulty adjusting to new water bottles. Many breeders suggest offering a dish of water as well as a bottle. Make sure your hedgehog is proficiently using new water bottles before removing the dish. Water bottles can get clogged or blocked. Test the tip of the bottle to make sure water flows freely. Severely dehydrated animals require a trip to the veterinarian to have fluids administered subcutaneously. Refer to our Water and Food Receptacles article for more information on this topic. Look for broken or missing teeth, irritation, pale color, discolored teeth, or a strange odor. Tooth and gum problems can lead to more serious conditions so it is best to have a veterinarian asses the problem as soon as possible. Some hedgehogs may become what are called “affection feeders”. These hedgehogs readily eat when they are hand or syringe fed. This odd behavior is a hedgehog’s way of demanding attention. There are times when hedgehogs will attempt their form of hibernation. Their body will feel cool and the animal will be lethargic. The optimal temperature range is 75°F and above. Make sure your hedgehog is warm and comfortable. It is a good idea to put the hedgehog on a heating pad, next to your body, or on warm towels. Refer to our Temperature Requirements and Heating Options articles for more information on this topic. Evaluate potential causes of anorexia. Monitor weight gain or loss. Refer to our Weight Log article for more information on this topic. The first thing to do if your hedgehog stops eating or doesn’t eat for even one day is to immediately start offering your hedgehogs favorite treats. Just like picky children hedgehogs will have their own tastes and preferences. Sick hedgehogs may have to be enticed to eat by trying a variety of different tastes and textures of food. By having a list of favorite treats you will save yourself both precious time and money while trying different treat options. Refer to our Hedgehog Treats, Special Foods, and our Insects A la Carte article for a wide variety of human foods and non-human foods that may tempt your hedgehog to begin eating again. Helps combat gas by breaking it up in the intestines.